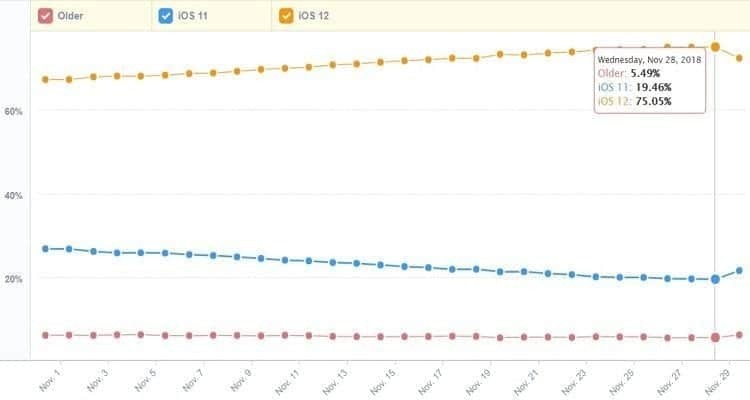 Impressive the ride of iOS 12 that, two and a half months after the release has reached a rate of installation on Apple devices on the market without precedent. Before the data is scanned, it is worth remembering that these are unofficial figures (they are provided by MixPanel) but that they are fully in line with the latest surveys provided by Apple. Well, the latest version of the operating system is already installed on 75% of Cupertino devices around the world, including older ones that no longer receive software updates. An exceptional result if you think that iOS 11 came to register this rate of adoption only in April this year, almost seven months after the release (59% in December, 65% in mid-January). It must also be said that iOS 11 was among the most affected versions of bugs and malfunctions in recent years. The comparison then must be done with the version that held the previous records: iOS 10 came to 76% at the beginning of January 2017 , the result then reached more than a month before from iOS 12. More specifically, 75.05% of Apple devices today have iOS 12 installed; follows iOS 11 with 19.46 while the remaining 5.49% is to be shared with previous versions of the operating system. We’ll see if in the next few days Cupertino will confirm the numbers provided by MixPanel.